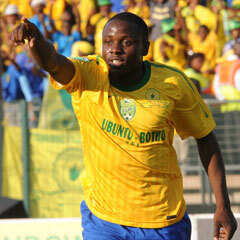 Atteridgeville - With their first three points at home in 2012, Mamelodi Sundowns were able to reclaim their spot at the top of the Absa Premiership with a 3-1 win over Santos at the Lucas Moripe Stadium on Sunday afternoon. The victory also ended a two game losing streak in the league for the Brazilians as they moved tied on points with Orlando Pirates at the top of the log, but with a superior goal difference. The result sees them holding their own fate in their hands going into the last three rounds of the Premiership while for Santos they remain in 15th place on the log only six points above Jomo Cosmos, but having played two games more. The win for Sundowns was orchestrated through their superb wing play that created problems for the Cape side’s defence from the first whistle, and it came as no surprise when the first goal originated from the right flank in the 20th minute. The People’s Team, though, were a little unlucky to go behind after Pere Ariweriyai headed the ball into the back of his own net while attempting to clear a ferociously whipped in cross from Elias Pelembe, 1-0. After going in front the Brazilians seemed to find their stride and starved Santos of possession. And in the 38th minute there was nothing the People’s Team could do to stop the second goal. Again the goal came about because of ‘Downs wing play as Lebohang Mokoena produced a pin-point right wing cross to find Nyasha Mushekwi unmarked inside the box. And Sundowns' top goal scorer made no mistake with his ninth league goal of the season, a deadly header from ten-yards out to double his side’s lead, 2-0. The second half was more of the same as Santos looked to be chasing shadows while ‘Downs stroked the ball around the park with consummate ease. In the 63rd minute Hlompho Kekana put the result beyond doubt with a wicked shot from the edge of the 18-yard box that found the bottom right-hand corner of the goal, 3-0. Santos did manage to find a consolation goal through Eleazar Rodgers in the 76th minute, 3-1, but it was not enough to scare a Sundowns team that never looked like losing.